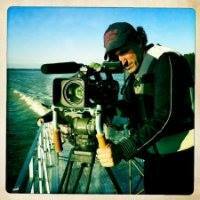 Simeon Soffer is an Award-Winning Director, Cameraman, Editor and Executive Producer. His films have been Nominated for an Academy Award, Premiered at the Sundance Film Festival, AFI Film Festival, and many many others. He’s won Best Director at the HBO Aspen Comedy Fest, the Audience Award at CineVegas and won the International Documentary Award. His current film “West 4th St: Portrait of a Park” screened at the Madrid Film Festival, DocUtah, and won awards at the Manhattan Film Festival, Nevada Film Festival, and others. In television he’s Executive Produced a Discovery Channel series for Animal Planet called “Louisiana Lockdown”, has directed on “Kitchen Nighmares” with Gordon Ramsay and produced on reality shows from “Nanny 911” and “Paris Hilton’s new BFF” as well as many others. His Broadcast Post Production televison credits include hit shows like Jersey Shore, Joe Millionaire, Deal or No Deal, My Big Fat Obnoxious Fiance, and the Rachel Zoe show to name a few. He also has Directed and Produced numerous Corporate Video Productions for Hilton Hotels, Hilton Grand Vacations, Expedia and many others. He is a graduate of California Institute of the Arts and the High School of Art and Design in NY, and lectures at the UCLA School of Film and Television. SARA CHAMBERLAIN HAS PRODUCED TELEVISION CONTENT FOR CBS, TLC, LIFETIME, DISCOVERY, SHOWTIME, ABC FAMILY & CMT, AS WELL AS PSAS AND DOCUMENTARIES FOR MANY MAJOR NETWORKS. She has also worked on the Emmy Award Winning Penn and Teller show and worked closely with Jennifer Lopez in her business ventures. She Graduated with a BFA in Film at San Francisco State. She is familiar with all phases of production from sales through post production. Sara has recently joined the Advanced Idea Media team, having worked with Director Simeon Soffer in the television industry. She is currently overseeing production and marketing as well as working on development for new projects. As a DEVELOPMENT EXECUTIVE and CREATIVE WRITER, Charlie Shahnaian is an experienced storyteller, creator and leader with over fifteen years of entertainment industry credits. Broad based background in film, television and theater provides him with a unique bridge between executive and creative environments. Superb ability to analyze scripts for story structure, character, theme, marketability and studio appropriate content. Charlie’s MARKETING work covers a diverse group of clients, including advertising agencies, financial institutions, international nonprofits, entertainment & special events groups, and religious institutions. He has produced web copy, key art, advertisements, brochures, direct mail, promos, speeches and VOs, as well as other product specific materials. Recognized as a decisive leader, hard worker and excellent team player, evidenced by both workplace experience and robust non-profit work. Charlie is passionate about providing outstanding quality written work, reaching the broadest possible audience for maximum impact. Eric Schwabel is an award-winning celebrity, editorial and commercial photographer. Schwabel has shot ads for Toyota, Pepsi, Ritz-Carlton, NBC/Universal, ABC, and the Oscars; photographed such high-profile celebrities as Jimmy Kimmel, Benicia Del Toro, Paul Dano, Chris Pine, Tim Robbins, Megan Mullally, Nick Offerman, Dane Cook, Adam Lambert and Kirk Douglas. His editorial work has been featured in Deadline Hollywood, Allure, the Advocate, Pacific Standard and Los Angeles magazine. In 2009, Bruno Gmunder published Schwabel’s first monograph, titled “Shooting Male,” to rave reviews, immediately followed in 2010 by his creation of "the Human Light Suit," a 10-year photographic portrait survey of the Burning Man Project, which remains underway through 2020. Now one of the most sought after young photographers in Southern California, Schwabel has recently photographed Neil Patrick Harris for the Academy Awards, spoken about his work at Open Show: Los Angeles, won 1st place at the 2014 IPA / Lucie Foundation’s One Shot: One World competition and recently signed with Contour by Getty Images for celebrity photography syndication. Schwabel has also been featured (on the subject of his work) by some of the top magazines in the world, having been profiled by Popular Photography, Rangefinder, Foto Hits (Germany) and Fotomen (China). Schwabel is a graduate of the Rochester Institute of Technology's School of Imaging Arts and Sciences, and has lectured at Art Institute of Hollywood.